The Apollo, the Majestic, Race No. 77 are legendary saddle names and the Persons-Majestic Company is bringing them back. "We have heard from our dealers and they have overwhelming told us to bring back our Persons-Majestic branded saddles," says Charlie Persons, President of the Persons-Majestic Company. "They say they like the saddles' features and price points. And they really like the styles. So were bringing the saddles back." Three Persons-Majestic saddles are being offered -- Apollo, Majestic and Race No. 77 -- for three styles of riding: cruising, mountain biking and racing. Each saddle is hand-crafted of quality leather, feature solid copper rivets, are supported with a steel frame, and available in five colors: black, brown, tan, green and blue. The Persons-Majestic saddles are available now in limited quantities. For dealer pricing, call 1-800-772-2453 or e-mail permaco@aol.com. 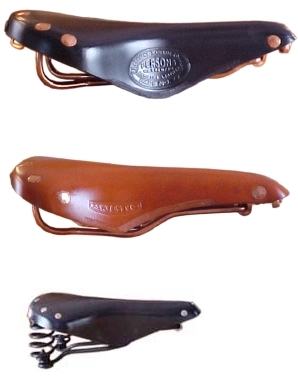 Persons-Majestic is a manufacturer of high-quality bicycle products since 1892. In addition, the company distributes Knog lights, bags, shoes and clothing, Cyclaire pumps and other superior bicycle products.